TAVARES, Fla. — Shaw Grigsby sacked 18 pounds, 12 ounces Saturday for an even tighter hold on the lead in the Sunshine Showdown. But even his 11-10 cushion might not be enough on Florida’s Harris Chain of Lakes, given its current crop of heavyweight spawners. Three days of enticing fussy bedding bass to bite resulted in a hard-won 62-11 total for Grigsby in the Bassmaster Elite Series season opener. Most in the Elite field agree that big spawners are still out there, and any of the Top 12 finalists competing Sunday could overtake Grigsby by landing a lunker and amassing a big bag. Or Grigsby’s magic could evaporate. That happened the last time the Elite field competed on Harris. 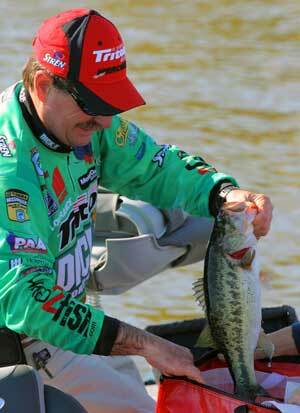 In that 2008 contest, Brian Snowden’s 10-pound lead was not enough to fend off Mike McClelland, who won then with 59-2. Already surpassing that after three days, Grigsby, veteran pro from Gainesville, Fla., is the first to nod to the reality of what the Harris Chain can do to a long lead. Grigsby’s success has been in a canal he’s been sharing with at least two others, Grant Goldbeck and Pat Golden. The leader found heartache there too. Saturday he lost a bass that he estimated at 5 pounds. “At the end of my day, she set up (on the bed), I threw in, and she ate it on the first cast. I got her to the boat, she went straight up in the air, and sent my bait flying, I don’t know why. I lost her, and that’s all there is to it,” he said. A win on Sunday would be the first in a Bassmaster event for Grigsby since 2000, when he won two to add to six previous Bassmaster wins. The Elite’s first prize is $100,000, an instant qualification for the 2012 Bassmaster Classic, and the lead in the points race for the 2012 Toyota Tundra Bassmaster Angler of the Year title. Going into Sunday’s final round of the Top 12, no pro near the leaderboard’s top was ready to concede to Grigsby. That included Goldbeck, who moved up from 16th place into the runner-up spot with 51-1; Stephen Browning, with 50-6; Golden with 49-2; and the hottest angler on the Elite circuit, 2010 and 2011 Bassmaster Classic champ Kevin VanDam, who had 48-10 for fifth place. Goldbeck brought in Saturday’s biggest bag, 22-15, as well as the largest bass, a 7-4. It was another success on top of Friday’s, when he sacked 27-1, but still he had regrets. 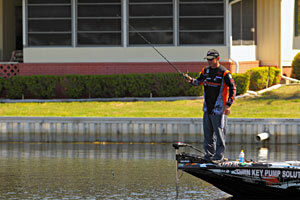 “I had a couple of 2-pounders in my bag today, and I left a few fish behind that are haunting me,” he said. One was a bedding bass he estimated at between 12 and 14. “For four hours I tried and never got her,” he said. He bypassed a 7-pound male on the same bed, making the call that taking the smaller bass would spook the behemoth. Grigsby and Goldbeck both said they thought their shared water would hold up under another day of pressure from them and Golden, also in the same small area. 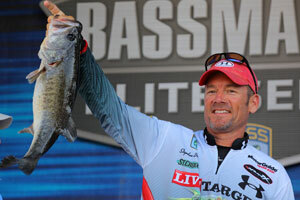 Third-place holder Browning, who said he was not fishing for bedding bass, said he changed his tactics.